This seminar is aimed at educating students in how we can make a difference to the thousands of refugees who come to Australia every year. Listen to speakers, including medical professionals and individuals who have come to Australia as refugees, recount their experiences. Mr Mojib Ullah is well respected among the Rohingya and other Islamic community members and is also the Imam of Darra Mosque in Brisbane. Mr Alyas Taqawi works at MDA in the new arrivals support team and has significant experience as a Case Work assistant. 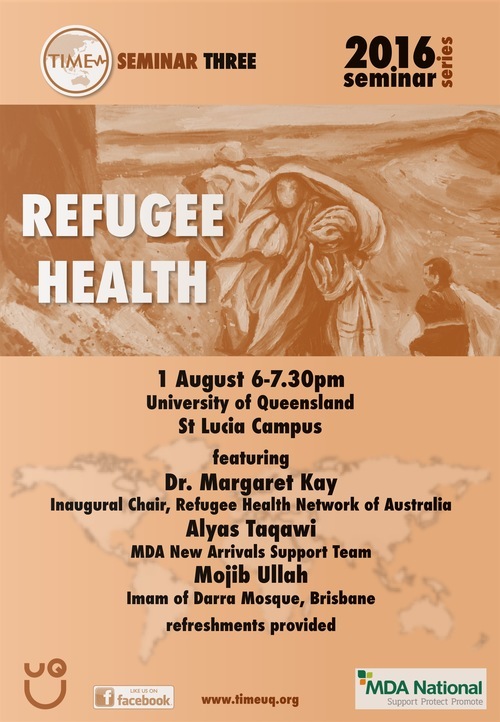 Dr. Margaret Kay is a part-time General Practitioner and was Inaugural Chair of the Refugee Health Network of Australia (RHeaNA). She was recently appointed as the Inaugural QLD Refugee Health Fellow. She is currently working with the team at Mater UQ Centre for Primary Health Care Innovation. She will be presenting some cases as well as her experiences working in refugee health. All Allied Health, Nursing/Midwifery and Medical Students are encouraged to attend!